What Would Mike Do? : The hotel blog: What is the difference between a hotel franchise and a management agreement? What is the difference between a hotel franchise and a management agreement? Not everyone who owns a hotel manages it. That's where hotel management agreements come in. Even fewer own a nationally recognized hotel brand. That's where franchises come in. Anyone can buy, build, or own a hotel. Doing so can be very rewarding: many doctors, lawyers, dentists, and people who've made a pile in tech ventures should consider doing it. (Like 'Rich Dad' Robert Kiyosaki says, you make money in business, you keep it in real estate.) It can be a profitable real estate investment - but it's not a passive investment. It's a business. (If you bought your hotel from a commercial broker at a price based upon 'cap rate' -- which is not an appropriate metric for hotel valuation -- then chances are, you're in for a painful lesson in just that. I'll try to be gentle with you when you call me to try and fix it, but there will be only so much I can do because you didn't call me first. That's the lesson: you should have called me first.) A hotel must be managed with some level of skill and intentionality. Of course, many doctors, lawyers, dentists, and people who've made a pile in tech ventures don't want to get bogged down in the unfamiliar wilderness of managing a hotel. That's understandable, and even respectable. It's not as easy as many people think, and everyone should stick to what they can do best. But they can still own a hotel: we can work out something. That's why we're here, to make it possible for you. A hotel management company is an organization that contracts to manage hotels for others. It's a twenty-year agreement, that allows us to lease the hotel from you (we're contractors, not your employees, and we're going to keep it that way) and calls for us to manage it for you. If we're doing it right, then the responsibility of owning a hotel should, for you, amount to nothing more than getting a report - and a check - from us every three months; and meeting up with us every year to talk about how things are going, what we need to be doing for the coming year, hearing about our plans for it, and okaying our budget. A franchise is a licensing agreement by which a particular hotel -- maybe even yours -- is operated under a particular brand, or 'flag'. Choice Hotels, for example, owns no hotels. They do own the Comfort Suites, Comfort Inn, Sleep Inn, Quality Inn, Econo Lodge, Cambria Suites, MainStay Suites, and Rodeway Inn brands. Hilton Hotels own Hampton Inn, Homewood Suites, Home2Suites, Hilton Garden Inn, and Doubletree - and of course, Hilton. And Waldorf-Astoria. InterContinental Hotels owns Holiday Inn and Holiday Inn Express, Staybridge Suites, Candlewood Suites, Embassy Suites, and Hotel Indigo. Starwood owns Sheraton, Four Points, Le Meridien, and St. Regis; and such innovative (however pricy) brands as W Hotels, aloft, and element. And of course Marriott owns Marriott, Courtyard by Marriot, J. W. Marriott, Residence Inn by Marriott, Spring Hill by Marriott, TownePlace Suites by Marriott, Fairfield by Marriott . . . everything by Marriott. You get a pretty sign on, and in front of, your building that assures people that, if they check in at your hotel, they can expect standards consistent with that brand. It gives you access to a central reservations system, an 800 number, and a website. It gives your hotel listings in GDS and online travel agency databases (as though you can't get that on your own, anyway, with a property management system that sells for a thousand bucks, give or take). A better one will have a marketing organization at the national level that actually has time to work with you. Most will have some level of resources to assist you in forming and implementing good internal management practices -- although if you know so little about the business that you rely on the franchise organization to train you to manage a hotel, then you should not have invested in a hotel. And I certainly wouldn't consider any franchise organization that encourages you to count of them for such a comprehensive level of entry-level training, to be trustworthy. All at a price, of course. You pay eight and a half percent of your total revenue, more or less (it goes as low as two or three percent for some of the newer brands, or Best Western; and as high as twelve percent for Starwood brands). Actual costs once all of the additional fees and required purchases, even for a Choice or Wyndham franchise, bring their total closer to twelve percent. You decorate and furnish it with materials that they approve (beware the franchise organization that owns its own hotel supply business - guess whose materials they're going to approve, at their price, regardless of whether you can get better quality or a better price elsewhere?). If they're doing it right, then I should be able to build you a new Comfort Suites in accordance with their prototype, and have us assured that Choice will send lots of business our way - enough to make the fees, royalties, and advertising assessments worth paying; indeed, we should be happy to write the check. Of if you find a deal on an older property, and we convert it to a Ramada, the same thing will happen. We'll make the ongoing investment of money and work involved to operate it in accordance with their standards - and be assured that all other Ramada franchisees will be required to do the same. Or, if we do a Hampton Inn or Holiday Inn Express, I don't have to worry about some brand rep coming in for an inspection, and arbitrarily demanding that we replace the carpet in the lobby. We'll have to follow the standards and obey the rules, but we can do so confident that the rules benefit us more than they burden us, and that they apply equally to everyone who flies the same flag. Many franchise organizations, however, don't do it right. Many of the older brands are so out of integrity with what they were originally intended to be that they're worthless. Hotel franchising, as an industry, would have crashed and burned in a spectacular way that would have been sickening to watch ten years ago, if only mortgage lenders would just have the decency to let it happen. If you sign a franchise agreement, with many brands, you have no assurance that they will not, a few years down the road, allow hotels into their system that don't come close to the quality of your own, with which you will be pressured to compete on price. A little over ten years ago, Baymont Inns -- the last 'new build' brand that I really 'believed' in -- was the brand to have, just as ten years earlier, Hampton Innwas the brand to have, just as Comfort Inn was ten years before that. Look at what Baymont and Comfort Inn are now (and go by the actual hotels of these brands that you see out there, not by the pretty pictures on the website): Comfort through accumulated neglect, retention of hotels in its system that should have been booted out fifteen years ago, and being marketed together with Choice's 'cheaper' brands; Baymont through brand corruption brought about by, at first, a reversal of its policy against accepting any but newly-built hotels into its system that conformed to a specific prototype, then by overselling of its franchises. It's like a law: if you keep lowering your standards, eventually you're going to have pretty low standards. Or with other more solid, upscale brands, you have no assurance that they won't make uninformed -- or completely arbitrary -- demands for upgrades to your own property. A Hilton Garden Inn can be required to replace its carpet throughout the entire lobby on the demand of its brand rep. It wouldn't be so bad if you could look down at the carpet and tell why. And now, there are less than a dozen Hampton Inns of that type of construction left, and if you want to buy one from an existing owner, you won't get the franchise with it. That does mean, nasty, ugly things to the value of the property, especially if the best you can manage for a conversion brand is this . . . Yet, the need for franchised brands - apart from mortgage lender requirements - is diminishing year by year. Most brands don't actually help the hotel. If twelve percent of my customers are referred by the franchise, and half of them originated from an OTA or GDS link (which I could hook us up with with any property management system worth having), and I'm paying 8.5% in fees and royalties for that franchise, then I'm paying 8.5% of my entire revenue for six percent of my business. Yet, the mortgage lender requirements are the only thing keeping the franchise agreements in place - if you carry a mortgage, in many cases, the lender requires you to have a franchise. You'd think the franchise organizations would notice, and see down the road, and try to be more supportive of those of their hotels that want to operate as an asset and credit to the flag, and to kick out the ones that want to be a burden and an embarrassment to it. But that would cost them a lot of revenue that they can count on now, more or less, over the next ten years, give or take . . . for an uncertain return. What makes the return uncertain? Well . 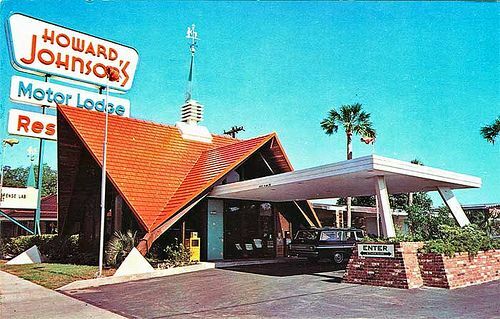 . . if Wyndham has given up on the once-great Howard Johnson's brand and is not confident that it can be repositioned and fixed, why should I believe in it? We're talking about a commitment - with several of Wyndham's brands, not just Travelodge; with several of Choice's brands, not just Comfort Inn - that would take five to ten years to carry out, that would cause them reduced revenues from the brand for that long. It's an investment for them, that they don't want to make. Only trouble is, hotel franchise agreements run for twenty year terms . . . and you want me to sign one? They're not willing to make a five-to-ten year commitment to shake out the brand and revamp it, yet they want me to commit to twenty? . . .
We'd be better off creating a new brand ourselves. We make the absolute commitment that this is what it's going to be, this is what the traveling public can count on it for, and it's going to be very much the same, ten, twenty years from now - we're not going to start cutting corners, or compromising, or settling for less than what it should be, or franchising it and just using its former glory to collect fees and royalties on. And dammit, we're going to stick to it no matter what, even if I don't get my new Audi this year, and have to drive the one I bought new last year for one more year. We wouldn't be breaking new ground to do that, if we did it well. Look on the TripAdvisor hotels page for any city of any size. Notice how the highest rated - and the highest priced - hotels are independent hotels, boutique hotels, hotels that operate under their own homegrown brand? Hotels where the ownership, developers, and management put something of themselves into it; rather than just buy a franchise, develop and run it in any old way that the franchise organization will let them get away with, and expect it to be handed to them on a plate. Over the last five to ten years, that's what the world's come to, and that's the direction it seems to be taking in the future. And yet, conventional wisdom is that a franchise assures 'consistent standards'? . . . And 'success'? . . . Eventually, the mortgage lenders are going to come around; hopefully, when we have a repeat of 2008 and this time around, franchised properties previously assumed to be 'safe' start dropping like flies. That'll be the end of hotel franchising -- unless they can come up between now and then to add value that is worth the fees they continue to charge.